The lawyer for former Nissan chief Carlos Ghosn has revealed the terms his client had to meet to secure his initial release from custody on bail. Conditions the 65-year-old had faced included using a sole computer, in his lawyer’s office, and one mobile phone. A 24-hour surveillance camera also had to be installed at the entrance of his court-approved permanent residence. Mr Ghosn was re-arrested in Tokyo last week, pending trial over claims of financial misconduct. He has been detained over suspicions that he tried to enrich himself at the carmaker’s expense. 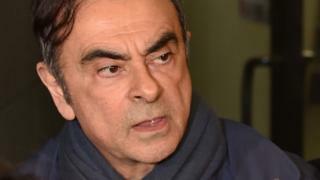 In a statement, Mr Ghosn – who denies any wrongdoing – said his re-arrest was “outrageous and arbitrary”. Mr Ghosn’s lawyer, Takashi Takano, issued a blog post (in Japanese) over the weekend where he outlined his client’s bail conditions after he was released from custody on 6 March. Mr Ghosn had been released on $9m (£6.8m) bail after 108 days in custody. The conditions stated Mr Ghosn must not flee or hide, not travel abroad. Any travel within Japan of more than three days would have needed court sanctioning. Any change of address also had to be approved by a court. Mr Ghosn also had to keep a log of everyone he met – except his wife and legal counsel – as well as records of telephone calls and internet use. He was also ordered not to make contact with a number of fellow defendants, including board member Greg Kelly, suspected of collaborating with Mr Ghosn. Tokyo prosecutors entered Mr Ghosn’s residence before 06:00 local time on Thursday (21:00 GMT Wednesday) and took him to their office on suspicion he had misappropriated Nissan funds for personal use, Japanese broadcaster NHK reported. Mr Ghosn’s lawyer said it was almost unheard of to arrest someone after being released on bail. “I am innocent of the groundless charges and accusations against me,” Mr Ghosn said in a statement released by his representatives. He said the arrest was “part of another attempt by some individuals at Nissan to silence me by misleading the prosecutors”. The move is the latest twist in a case that has attracted global attention. Mr Ghosn was the architect of the alliance between Nissan and French carmaker Renault, and brought Mitsubishi on board in 2016. He is credited with turning around the fortunes of Nissan and Renault over several years. Prosecutors said Mr Ghosn’s latest arrest related to transfers of Nissan funds totalling $15m between 2015 and 2018. They suspect $5m of that amount was used by Mr Ghosn for personal expenditure. Local media had previously said that authorities had been building a new case against him involving payments to a dealership in Oman. In Japan, prosecutors are permitted to re-arrest a suspect on a slightly different accusation, with approval from the courts. The clock is then reset and another 20 days of interrogation can begin. Mr Ghosn was first arrested in November for understating his pay. He was re-arrested twice in December and faces three charges. He was first charged with underreporting his pay package for the five years to 2015. In January, a fresh charge claimed he understated his compensation for another three years and he was also indicted on a new, more serious charge of breach of trust. The motor executive had said on 3 April, in a newly created Twitter account, that he was planning a press conference on 11 April “to tell the truth about what’s happening”.